While April is showing off the site of the new Channel Six news building, The Turtles realize that they have forgotten April’s birthday. Meanwhile, the Technodrome is under some kind of attack. Bebop and Rocksteady go out to investigate, and they are abducted into a stranger alien craft owned and operated by SHREEKA. 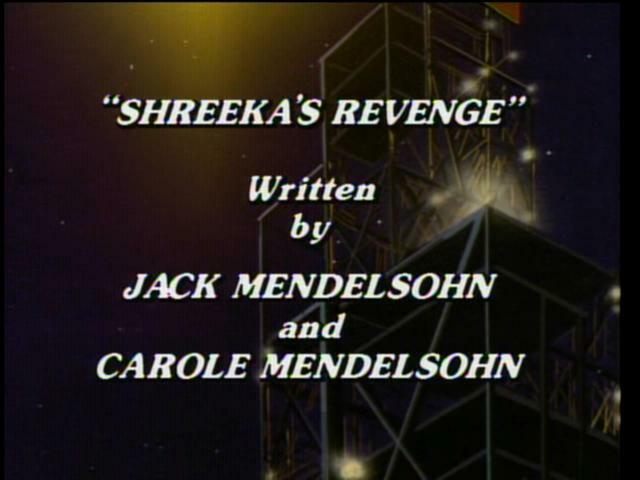 Shreeka is an alien with an attitude and a vendetta against Krang. It seems that she and Krang used to be partners until he double-crossed her. She has spent eons tracking him down and now she has finally found him. What she wants, besides Krang’s brain on a stick, is her most potent weapon, her Power Pack Energy Ring. Krang lies and tells her that he has given it to April. While Shreeka heads for the City, Krang gives Shredder the Ring and tells him to deliver it to April ASAP. Shredder is reluctant. Shred-head believes that a ring this powerful should be put to better use. Krang assures him that the ring is virtually useless – most of the power has drained out, but it will make the perfect “pawn” in their desire to be rid of the Turtles. Krang surmises that once Shreeka goes after April, the Turtles will come to her rescue and die for their efforts and destroy Shreeka in the process. While Irma buys a surprise birthday cake for April and the Turtles window shop at Spiffany’s Jewelry Shop, Shredder arrives in town. The nasty ninja gift wraps Shreeka’s ring and has it delivered to Channel Six News with a card from the Turtles. Only Shredder is still not convinced that the ring is not worth having and decides that he will stick around and reclaim the jewelry after the Turtles and Shreeka annihilate each other. But moments later, the Turtles have thier first run-in wiht Shreeka. After an Interglactic Scan Search, the TMNT discover that Shreeka is an interplanetary outlaw wanted in thirteen different galaxies for crimes too unspeakable to speak of — and that she is after April. The Turtles run all over town in search of April but they are always two steps behind her and one stop behind Shreeka. In the final battle scene, Shreeka destroys the new Channel Six Building (still under construction) and ultimately her precious Power Pack Energy Ring. The Turtles rescue April and back at the lair, celebrate her birthday with a large birthday pizza – complete with candles.